SICKOFITRADLZ: As West Virginia goes . 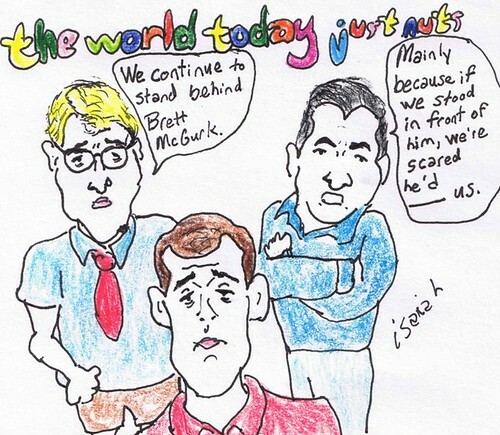 . .
Isaiah's The World Today Just Nuts "Standing Behind McGurk" went up Sunday night and this afternoon McGurk was no longer the nominee for US Ambassador to Iraq. Mr. Obama is unpopular in the state and lost 41 percent of the West Virginia primary vote to a convicted felon. Manchin -- who faces his own re-election battle this year -- has said he's not sure he'll vote for Mr. Obama. The decision to skip the convention is a significant reversal for Manchin who in 2008 addressed the national convention in Denver. He then told Democrats to elect Obama the next president. Obama lost West Virginia that year and has gotten less popular since. Just last month, a convicted felon who is still locked up in a Texas prison beat Obama in nine of the state's 55 counties and won about 40 percent of the vote in the state Democratic primary. Again, that really gets to the heart of how there is no clear and easy victor in the presidential election currently. Monday, June 18, 2012. Chaos and violence continue, a funeral for pilgrims turns into another bloodbath, Brett McGurk waves bye-bye, Camp Ashraf is strangely confusing to US State Dept spokesperson Victoria Nuland, and more. United Nations High Commissioner for Refugees Special Envoy Angelina Jolie: Every minute, 8 people around the world are forced to flee their homes due to war and persecution. No one chooses to be a refugee. Today, 43 million people worldwide have been displaced. We remember them. Wednesday is World Refugee Day. UNHCR notes that the last year alone saw an additional 800,000 refugees. In the just released UNHCR Global Trends 2011, details such as 46% of refugees are under the age of 18, that three areas of concern are the displaced of Columbia, of the Democratic Republic of Congo and of Iraq, and that the Middle East and North Africa have a larger number of refugees than the Americas and and Asia and Pacific combined. (Africa has the largest number of refugees with 2.1 million to the Middle East and North Africa's 1.9 million.) Through the end of last year, Iraq could claim 1,428,3000 refugees. Only Afghanistan topped that figure (Afghanistan had 2.6 million). Yesterday, Oliver Maksan (Aid to the Church in Need) noted Iraqi Christian refugees in Jordan like Lina who declares, "I never want to go back to Iraq, ever." Why? Because she was almost killed. Because her nephew was among the many killed in the October 31, 2010 attack on Our Lady of Salvation Church in Baghdad. NPR's Deborah Amos has documented the refugee crisis and written the book on it with Eclipse of the Sunnis: Power, Exile, and Upheaval in the Middle East (now out in soft cover -- available at Amazon right now for $6.40). We'll try to note World Refugee Day again tomorrow. But turning to the big news of the day . . .
. . . the ridiculous nomination of Brett McGurk to be the US Ambassador to Iraq. Andre Tartar (New York magazine) reported yesterday, "Just days after seven Republican senator on the Foreign Relations Committee urged President Obama to pick a new nominee for the ambassadorship to Iraq, the White House is doubling down on Brett McGurk. Speaking on CNN's State of the Union this morning, senior White House adviser David Plouffe said, 'We've made this nomination and we think he will ably serve as ambassador'." Plouffe sounded as confident in the nomination as Gina Chon when she wrote in her fantasy e-mail, "The question I continue to have is when will the conversation return to issues? Because when they do, I know Brett will become the next ambassador to Iraq." She wasn't much of a reporter (the Wall St. Journal allowed her to save face by announcing her resignation last week) and it turns out she's not psychic either. CNN makes the news of the no-longer nomination a "Gut Check" for the day. Jon Swaine (Telegraph of London) notes, "Flirtatious emails between Mr McGurk and Ms Chon from 2008, when both were working in Baghdad and married to different spouses, were leaked last month, throwing his nomination into crisis. [. . .] Ms Chon, who worked at the Wall Street Journal, resigned last week after the newspaper said she had broken its in-house rules by sharing details of forthcoming articles with an outsider [McGurk]." Among the questions McGurk would have faced had the process gone forward were what, if any, information was leaked to Gina Chon in her capacity as a reporter. With leaks being a big issue in DC these days and with Chon and McGurk mentioning trading favors in their e-mails to one another, this issue was on the minds of some. Ted Barrett and Kate Bolduan (CNN) point out, "In an e-mail to friends Friday, she said the e-mails she traded with McGurk 'which were exposed just before Brett's confirmation hearing reflected flirtatious banter and nothing more'." Emily Heil (Washington Post) reminds, "The e-mails were not the only hurdle to Senate confirmation for McGurk. Sen. John McCain (R-Ariz.) had previously criticized his handling of U.S. policy in Iraq, including the inability of U.S. and Iraqi negotiators to reach a deal that would have left a small U.S. military presence behind." There were many reasons not to support him. That includes the e-mails which made it very unlikely that Iraqi women could access the US Embassy. While stupid sob sisters in the US would huff, "They got married!," that doesn't mean a damn thing in Iraq. That he entered into an affair with Chon while he was married and while she was does matter in Iraq. And Iraqi women would have to fear accusations -- which could result in the so-called 'honor' killings -- if they didn't avoid the embassy. In addition, as a community member in Tikrit pointed out early this morning, the e-mails meant that Grand Ayatollah Ali al-Sistani and other clerics probably wouldn't meet with him. He wouldn't just be seen as a non-believer or follower of another religion, his actions portrayed in the e-mails would mean they would shun him. You also have to wonder that since he was e-mailing Chon about his "blue balls" before they'd slept together or kissed, exactly how were US State Dept employees who were women going to be treated by new boss McGurk? He couldn't speak Arabic. Iraqiya -- the political slate that won the most votes in the 2010 elections -- was against him and lodged an official complaint objecting to his being the new US Ambassador. Adam Entous and Janet Hook (Wall St. Journal) add, "Some Republican senators said Mr. McGurk lacked the experience to head a major embassy in a volatile region. Mr. McGurk, 39 years old, hasn't served as ambassador to any other countries." They also quote James Jeffrey making some idiotic remarks. Word to Jeffrey, when you're a US diplomat and you put your foot in your mouth like you did last week (signing the letter declaring Brett McGurk "the best man for the job" -- not person), probably a good idea to lower your profile. You have no idea how many women in the State Dept your little letter pissed off -- rightfully so. Matthew Lee (AP) plays nice insisting Jeffrey "and his two predecssors in Baghdad" along with the administration "had staunchly defended McGurk as the right person for the job". But Matthew Lee is aware of the actual word choice since he reported on the letter Jeffrey, Chris Hill and Ryan Crocker sent, noting he was quoting from "a copy of the letter obtained by The Associated Press" when he included this statement the 'diplomats' signed off on, "Brett is the right man for the job." Funny, at a time when Hillary Clinton is the second female Secretary of State, you might think the notion of "right man for the job" would have flown out the window. Again, women at the State Dept, career employees, were not pleased with the letter and if Jeffrey feels the need to speak again, he might want to issue an apology for his word choice. That would be the 'diplomatic' thing to do. He should have stepped down as soon as the e-mails became public. It was idiotic not to. What is acceptable in the US really didn't matter though CJR and others didn't seem to get it, so gripped with their own feelings of superiority and xenophobia. What mattered was the way Iraqis would respond to a US Ambassador with that history. That was the most important thing. Not what the US press thought, what the Iraqis would think. He was supposed to be the US Ambassador to Iraq but for some reason the US press repeatedly chose to ignore Iraqis and to ignore how Iraqis would react to him. This is not a minor thing and the host country should be considered with all nominations. That doesn't mean, for example, we don't nominate an openly gay person to be an ambassador to a country where there is tremendous homophobia. It does mean that we have to be aware of it and we have to ask, "Can we send a message that helps the LGBT community in the host country with this potential pick?" If we can, it can very well be worth it. The US government, with the illegal war, turned Iraq over to exile thugs and thugs. They did so at the expense of Iraq's educated class (why do you think the 'brain drain' took place to begin with -- they left because of who the US installed). In the process, they destroyed the rights of women and they turned a secular country into a fundamentalist one. And someone thought the answer was to send an adulterer -- who committed adultry in the host country? Do they not get how insulting that was? Does no one in the administration understand the Arab world? Today Reuters notes, "McGurk's withdrawal throws a fresh question mark over Washington's uncertain relations with Iraq following the departure of U.S. forces last year." I'm sure it does. I'm also sure that confirming McGurk would have been seen as an offense by a significant number of Iraqis. Brett, all joking aside, I feel for you man. I know how it is to have State turn on you, push you out of a job and all that. Despite some water under the bridge between us, I think maybe we could get along, you know, maybe hang out now that both of us have afternoons free. Whattaya say, we leave the wives at home and hit a few rooftop bars, see what comes up, um, goes down, aw dammit, I just did it again didn't I? But we're moving on. Who's next to claim the head job at the world's largest and most expensive embassy? The previous landlord, Jim Jeffrey, quit the job so quickly that he didn't even wait for his replacement to arrive. Now everyone else in Iraq falls under a State Department policy requiring the outgoing person to stay on for a week overlap with his/her replacement, but like lots of things at State, that only applies to the little people. So who will it be? One rumor is that Obama will nominate Meghan O'Sullivan. Sully, like McGurk, is another Bush administration left over covered in Iraqi blood. Aseel Kami (Reuters) reports that as mourners gathered in Baquba funeral tents to pay their respects to pilgrims killed in recent violence, a suicide bomber blew himself up and claimed at least 15 other lives. Deutsche Welle explains, "The blast occurred in a tnet where mourners, including several high-ranking armed forces members, were paying respects to the family of a Shiite tribal leader in Baquba, authorities said." Mohammed Tawfeeq (CNN) adds, "Neither of the military officials -- identified by police officials as Lt. Gen. Ali Ghaidan, commander of the Iraqi army's ground forces, and Abdul Ameer al-Zaidi, commander of Diyala military operations -- were killed, though at least three guards for Ghaidan died." KUNA offers, "The source told KUNA that a suicide bomber, wearing an explosive belt, blew up himself while being inside a mourning house in Baquba, the largest city in Diyala." BBC News counts forty injured. AFP notes the death toll rose to 22 with fifty injured and that these two totals were verified by Baquba General Hospital's Dr. Ahmed Ibrahim. Wednesday, Iraq was slammed with bombings which Mohammed Tawfeeq (CNN) reported the Ministry of the Interior stated claimed 93 lives and left three hundred and 12 injured. Of Saturday's bombings, Mohammed Tawfeeq (CNN) reported, "Two car bombs targeted Shiite pilgrims Saturday in Baghdad, killing at least 32 people and injuring 68 others, police said." Ahlul Bayt News Agency put the injured toll at "more than 140." As Kitabat noted earlier this week, the pilgrims were taking part in the holy journey on the anniversary of the death of Imam Musa al-Kadhim. Deutsche Welle noted Saturday, "Crowds carried symbolic coffins through the streets as pilgrims beat their chests in mourning as they made their way toward the mosque's two gold domes." Jamal Hashim (Xinhua) explained, "The pilgrims were marching on foot to return to their homes after they participated in the observation of one of the major Shiite rituals at Kadmiyah's masusoleum of Imam Mussa al-Kadhim the 7th of the most sacred 12 Shiite Imams. During the past few days, large crowds of pilgrims from Iraqi cities and some Muslim countries flocked to Kadhmiyah to observe the annual commemoration of the Imam's death." Hsahim also notes that Nouri's security measures included a ban on all vehicles in "and around the district of Kadhmiyah," as well as closing roads, dispatching military helicopters to fly overhead, adding checkpoints and dispatching "dozens of thousands of Iraqi security troops." AP quoted Mohamed Ali who state, "There is no real security, no real searches." AFP notes that today's violence also included a Baquba roadside bombing which claimed the life of 1 police officer and left two more injured and a Baquba roadside bombing which claimed the life of 1 shepherd. Reporting on Saturday's attacks, Duraid Adnan and Tim Arango (New York Times) observed, "The attacks represented an embarrassment to the army and police, and their top commander, Prime Minister Nuri Kamal al-Maliki, and raised questions about the ability of Iraq's security forces to protect the population." And that's what happens when you refuse to name heads to the security ministries. Nouri was named prime minister-designate in November 2010. Per the Constitution, he was supposed to name a Cabinet -- full, not partial -- within 30 days. Failure to do so meant that someone else would be named prime minister-designate. Instead of following the Constitution, Nouri was allowed to become prime minister in December 2010. AP quotes Brookings Doha Center's analyst and director Salman Shaikh stating, "Those behind the attacks, they've become more determined now and see more of an opportunity because of the dysfunctional political process." Jalal Talabani's been huffing all week. We'll cover it tomorrow. For six weeks now, the last remaining residents of Camp Ashraf have been refusing to move. Who? May 30th, United Nations Assistance Mission for Iraq (UNAMI) released "Report on Human Rights in Iraq: 2011." As the report notes, Camp Ashraf is "over 3,000 residents affiliated with the People's Mujahedin of Iran (PMOI)" that are being moved to Camp Liberty. These are Iranian dissidents who were welcomed into Iraq decades. That changed with Nouri's Iraq. The report notes the 36 deaths when Nouri's forces went into the camp April 8, 2011 and that it followed the assault of July 2009. The report notes that the United Nations -- specifically UNAMI and UNHCR -- have been attempting to act "as an impartial facilitator" in moving the residents to Camp Liberty. Approximately 2,000 have been moved. The UN Secretary-General's Special Envoy to Iraq Martin Kobler declared June 11th, "I urge the remaining residents of Camp Ashraf to relocate to Camp Hurriya without delay. The relocation process should not be stalled. I am concerned that there will be violence if the relocation doesn't recommence. Any violence would be unacceptable. I call on the Government of Iraq to avoid any forceful relocation. Each relocation must be voluntary. The United Nations supports only a peaceful, humanitarian solution and stands ready to facilitate." Which takes us into legal news, it's a shock to the administration but most others saw the ruling coming. Jamie Crawford (CNN) reports, "A federal appeals court has ordered Secretary of State Hillary Clinton to make a prompt decision on whether to remove an Iranian dissident group from the State Department's list of foreign terrorist organizations." This was a unanimous decision handed down by the US Court of Appeals for the District of Columbia Circuit. Why was it unanimous? Because the administration has been in violation for some time now. James Vicini (Reuters) reminds, "The appeals court ruled nearly two years ago that Clinton had violated the group's rights and instructed her to 'review and rebut' unclassified parts of the record she initially relied on and say if she regards the sources as sufficiently credible. It said Clinton had yet to make a final decision." The administration was in contempt. The courts and the executive branch were in conflict. (They still are.) What generally happens there is the court of appeals makes a united front because this is now a court issue (as opposed to the merits of the case from when it was heard earlier). Unlike the executive branch, the judicial branch has no security forces. So they want to send a message but they also want to do so without looking weak if the administration ignores them. So since two months was the target date for the State Dept to finish a review on the MEK, they gave State four months which, they hope, is more than enough time. However, the two months (as the judges know) was a guideline, not a promise. State made very clear before the court that they were not promising two months. So it could go on past four months. Four months carries them into October. If they're not complying by then, there's a good chance they won't. Whether Barack Obama wins a second term as US President or not, Hillary Clinton has already stated she was only doing one term as Secretary of State. So when November arrives, if there's no decision, there won't be a rush for one. If Barack wins re-election, he'll state that he has to find someone to oversee the department first. If Barack loses, they've already blown off the appeals court for over two years now, continuing to blow them off for sixty more days will be a breeze. Nouri al-Maliki has twice attacked Camp Ashraf -- and done so -- both times -- while US Secretary of Defense Robert Gates was on the ground in Iraq. He loathes the residents and has repeatedly attempted to force them back to Iran (where they would most likely be hamed and possibly put to death). This is not an unreasonable request on their part. If the US State Dept is declaring that a search must take place of Camp Ashraf and that the search will determine whether the group is terrorist or not, of course that search needs to take place immediately. Not after they've relocated every resident and no one is there to say, "Wait! They're planting weapons!" They being Nouri's forces. The residents have been attacked by them twice, they have no reason to trust them. An unidentified "senior U.S. official" tells Reuters, "We don't know why the MEK slowdown is underway." Seriously? It's no secret that they have requested that Camp Ashraf be searched now. The US should do that. If they want to follow up after as well, fine. But this is a group of people who are spooked and spooked for good reason. They are being forced out of their home. They are aware that the UN hasn't secured passage to other countries for those who've been transferred to Camp Liberty. They are aware that Iran wants them and that Nouri is in close contact with Iran. A search is a very simple thing that the US and the UN can conduct. It doesn't have to be the final search but it would bring peace of mind to the residents, so you do it. You don't fight it, you don't play stupid. If you're really not taking sides and you're attempting to do right by all, you do the search because you know (a) it will lower the stress and (b) it will allow the process of moving Ashraf residents to Liberty to start back up. The United States has made clear that cooperation in the closure of Camp Ashraf, the Mujahedin-e Khalq's (MEK's) main paramilitary base, is a key factor in determining whether the organization remains invested in its violent past or is committed to leaving that past behind. We fully support the path laid out by the United Nations for the peaceful closure of Camp Ashraf along with sustainable solutions for its former residents. The Camp residents and their leadership - both in Iraq and in Paris - should recognize this path as a safe and humane resolution to this situation. Only a peaceful implementation of the Iraqi government's decision to close the Camp is acceptable, and the Iraqi government bears the responsibility for the security and humane treatment of the individuals at Camp Ashraf. I find her statement less than genuine. (Washington, D.C.) -- Tomorrow, U.S. Senator Patty Murray, Chairman of the Senate Veterans' Affairs Committee, will outline her new legislation, the Women Veterans and Other Health Care Improvement Act of 2012, legislation to strengthen VA's programs for female veterans and for severely injured veterans who want to start families. Currently, VA's fertility treatment services do not meet the complex needs of severely wounded veterans. The nature of the current conflict and increasing use of improvised explosive devices leaves servicemembers far more susceptible to blast injuries including spinal cord injury and trauma to the reproductive and urinary tracts. Army data shows that between 2003 and 2011 more than 600 soldiers experienced these life-changing battle injuries while serving in Iraq or Afghanistan. As these injured servicemembers return home, they work to move forward with their lives and pursue their goals and dreams. For some this includes starting their own family. The Department of Defense and Tricare program are already able to provide fertility treatment to servicemembers with these injuries. Senator Murray's new legislation would address these issues by enhancing fertility treatment and care at VA, and allowing for fertility treatment for spouses. Following Senator Murray's speech, a documentary highlighting the stories of 8 women veterans and the physical and emotional challenges they face as they transition home following military service will be shown. More on Senator Murray's Women Veterans and Other Health Care Improvement Act of 2012 HERE.